﷯Stephanie Smith has always been involved with dance and fitness from an early age. From age 7 she attended dance and theatre lessons at the Eve Trew School of Dance where her passion for dance started. At the age of 18 she moved to Liverpool and completed professional training at Sir Paul McCartney’s Liverpool Institute of Performing Arts (LIPA) where she qualified with a Diploma in Performing Arts: Dance. A desire to pursue a career in teaching dance followed. Moving back to Newcastle and the Eve Trew School of Dance she then completed her International Dance Teacher’s Association (IDTA) Associate Ballet and Freestyle teaching exams- subsequently leading her to being offered a job within the dance school where she now works- teaching hundreds of pupils weekly a variety of dance styles including ballet, tap, theatre craft, musical theatre, street dance and freestyle, encouraging a healthy lifestyle for young children. Stephanie’s love for adult fitness arrived soon after where she went on to complete numerous qualifications for professional development including her Lvl 2 Exercise to music, Lvl 2 Chair Based exercise for the frail or older person, Street cheer and Urban Flow classes which she delivered for Gateshead Council. In December 2010 Stephanie qualified as a Zumba instructor, as one of the first instructors in Gateshead her classes were instantly successful and she identified an opportunity to promote an active lifestyle for adults in a class setting that was fun. 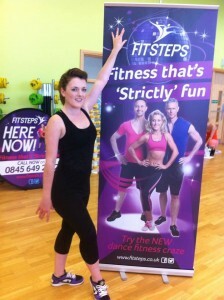 Subsequently she has completed further fitness programme qualifications including Zumba Kids, Zumba Kids Jr, Piloxing and her most recent Fitsteps to help offer a wider variety of class choices to her customer. Stephanie is very particular in selecting programmes; as only teaching classes where people can get fit whilst enjoying themselves and forgetting that they are exercising, as she feels this is key to a successful workout programme for individuals. The launch of Cre8tive Holiday Camps in August 2013 has also allowed Stephanie to provide a safe, fun environment for children during school holidays to develop their fitness, confidence, communication and team building skills. This also helps parents who may have difficulty in arranging child care, with camps developing further in the months and years ahead. Stephanie also likes to give back to the community and has enjoyed volunteering to choreograph for many local companies including Whickham Theatre Club where she has choreographed numerous pantomimes including Cinderella, Sleeping Beauty and Aladdin, as well as Nice Swan Theatre Company with whom she has choreographed productions of West Side Story, Hair, Gala 2012 and Gala 2013. Stephanie is tremendously enthusiastic and truly committed to ensuring every class she teaches is safe, provides results and most importantly is fun. She looks forward to seeing you at a class soon!